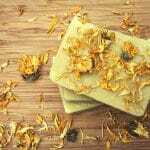 I’m really excited to share this post with you because of how wonderful, and surprisingly easy this is to make! 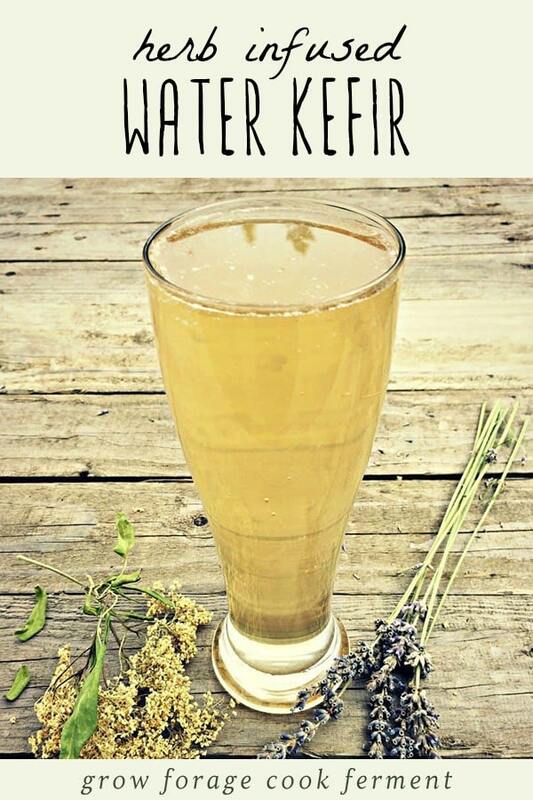 You may or may not have heard of water kefir, but let me tell you, it has changed my world. 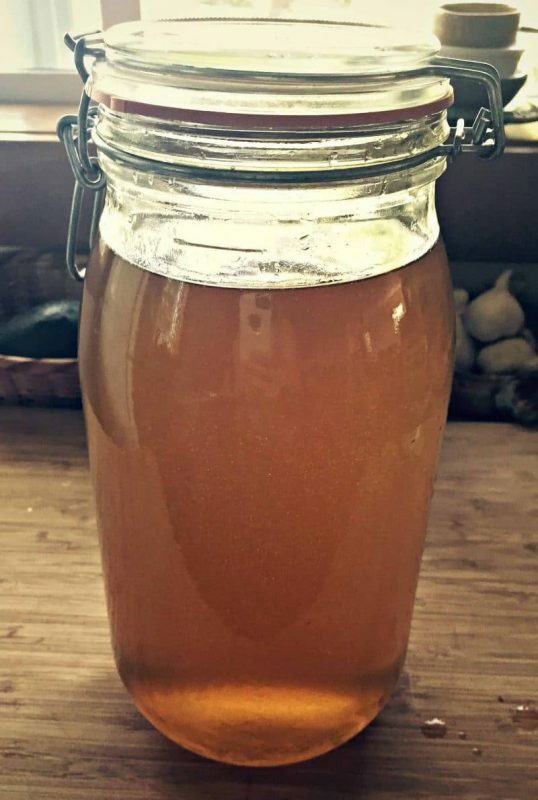 It is similar to kombucha, but easier to make, in my opinion, as well as more versatile. Yet, it’s still naturally fermented like kombucha is, so it has all of the good bacteria that our bodies need. 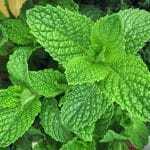 There are many different variations you can do for flavoring the soda, but making an herbal tea is my favorite way. 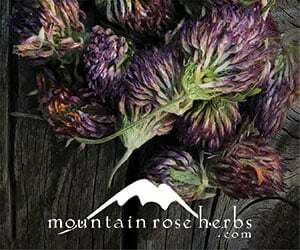 It makes me feel like I am giving my body a double duty benefit by adding in healthful herbs, plus it tastes wonderful. 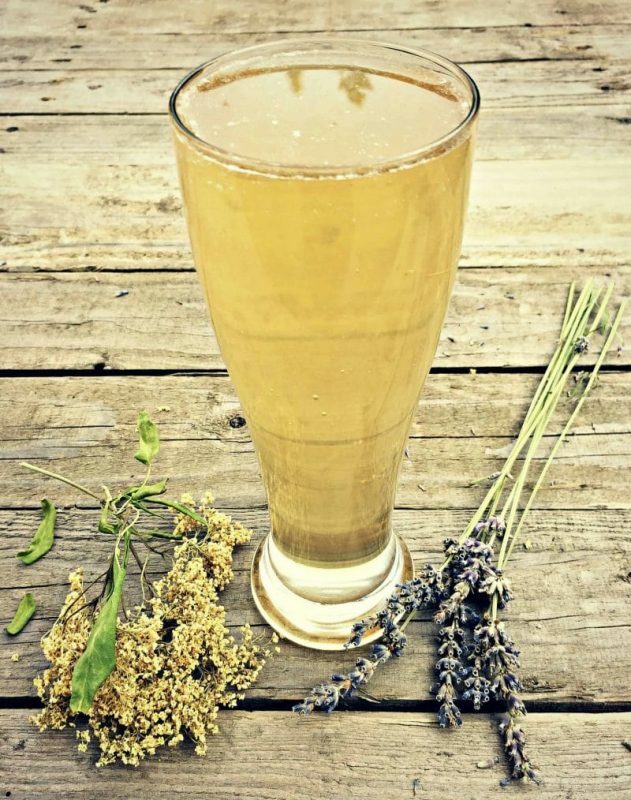 Here is how to make herbal water kefir soda, with a tutorial on how to make water kefir if you are unfamiliar with that process. Don’t worry, it’s easy! 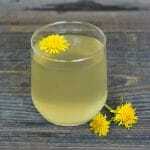 The first thing that you will need is to acquire water kefir grains, also called tibicos. Not really a grain, these are symbiotic culture of bacteria and yeasts, just like a kombucha SCOBY. 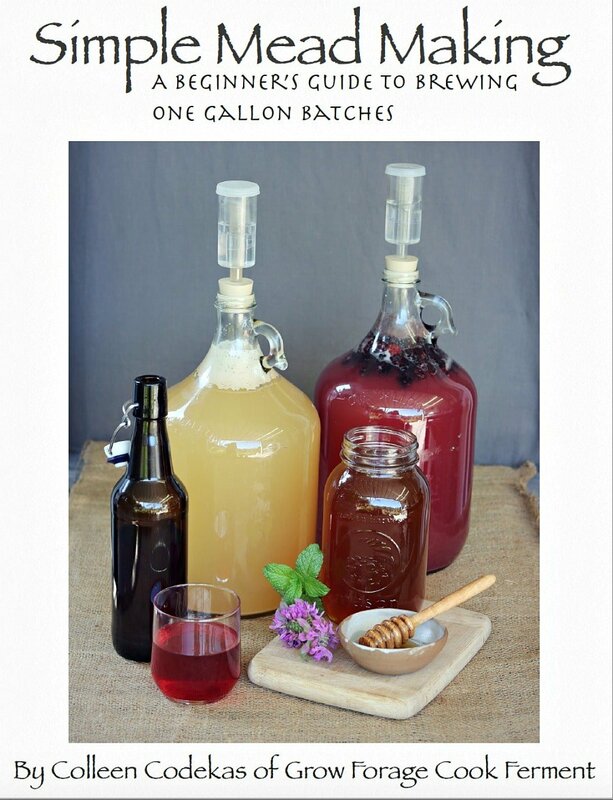 Get them from a friend if you know someone who makes water kefir, or order them online from Kombucha Kamp. Once you have your tibicos, start by putting a few tablespoons of them into the bottom of a quart jar. Then add 1/4 cup of sugar, preferably raw, even brown sugar works. Tibicos need extra nutrients, so they prefer a sugar that has a little bit of it’s molasses intact. It’s also good to add a few raisins for nutrients. 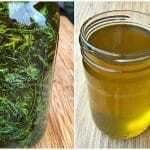 Then fill up your jar with unchlorinated water, leaving about an inch of space at the top. Stir gently with a long spoon to dissolve the sugar, being careful not to break up the tibicos. 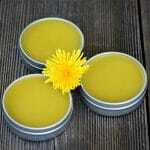 Cover the jar with a lid and set in a dark and out of the way spot for a few days. Stir it occasionally, and start checking the sweetness level after 2 days. I don’t like mine very sweet, so I generally let it go for 3-4 days. You should see little bubbles floating to the top. Once it’s at the sweetness level you desire it’s time to think about the flavoring you would like for you soda. 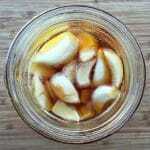 You can use fruit juice, flavored teas, or anything you think would make a good soda! For this one I’m using lavender and elderflowers. 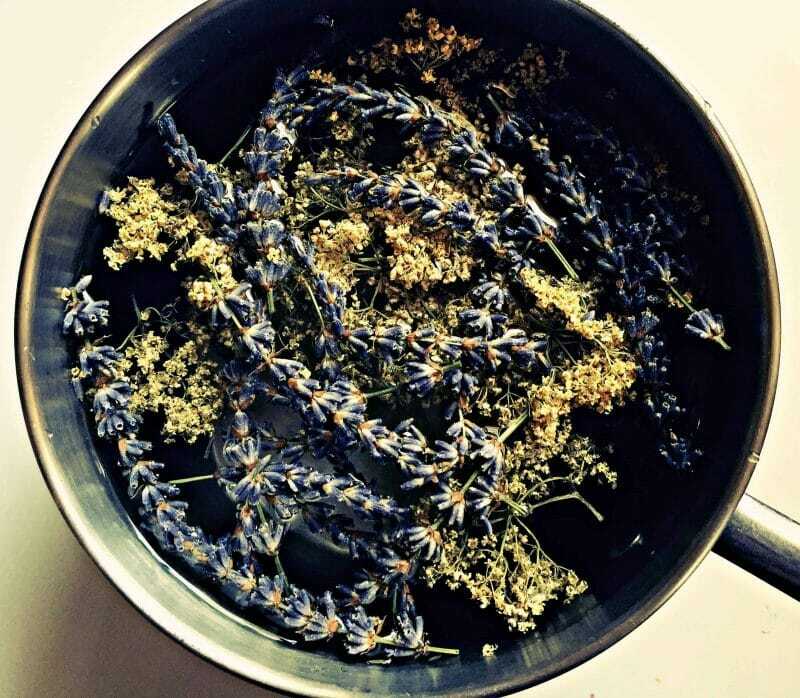 Start by bringing a quart of water to a boil and steeping the flowers. I steeped my for several hours as I wanted a strong tea. 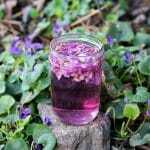 Once the water has cooled to room temperature strain out the flowers into a large jar (at least a half gallon). 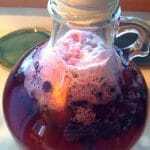 Then strain your water kefir directly into the tea. 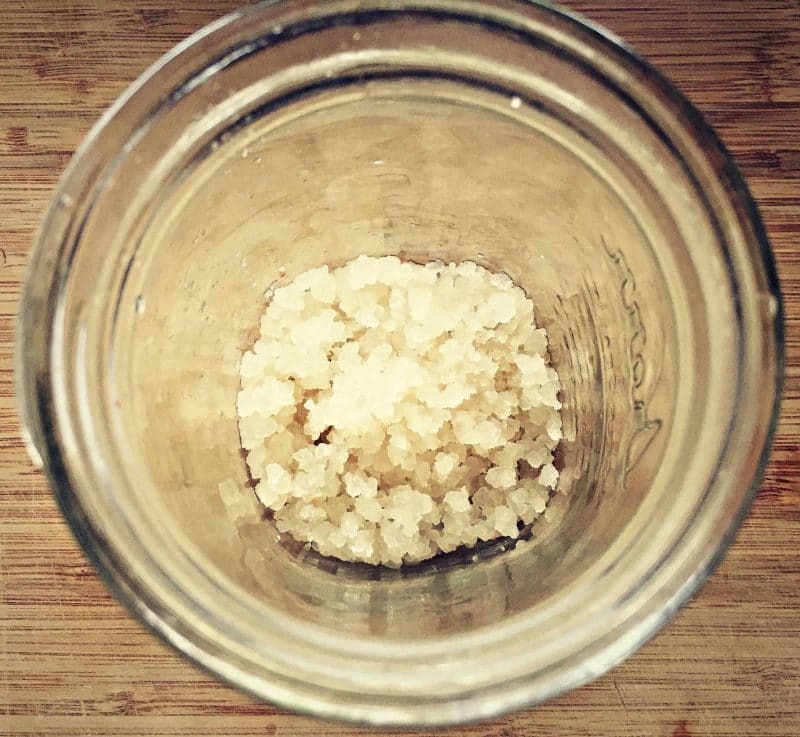 Save the tibicos for your next batch of water kefir. It’s an endless cycle! To make your soda bubbly you’ll need to seal the container. My half gallon jar has a flip top lid, so I just used that, but you can also bottle your soda into regular sized flip top bottles (reuse beer bottles with flip top lids, or buy from amazon). Leave the sealed bottles out at room temperature for a day or two, then refrigerate before opening. Careful when you open it as it will be carbonated and might be explosive! It probably won’t, especially if your flavoring isn’t sugary as that feeds the carbonation. It will most likely be fizzy and wonderful, just like a soda should be, but without all the bad stuff! 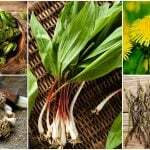 Just all the good healthy stuff that we should be consuming, like probiotics and herbs. This soda turned out really good, I was impressed! I’ve done it with hibiscus tea and it was also delicious. Any flavor will probably be good, and you don’t even have to add a flavor, as it tastes quite good plain as well. Experiment! 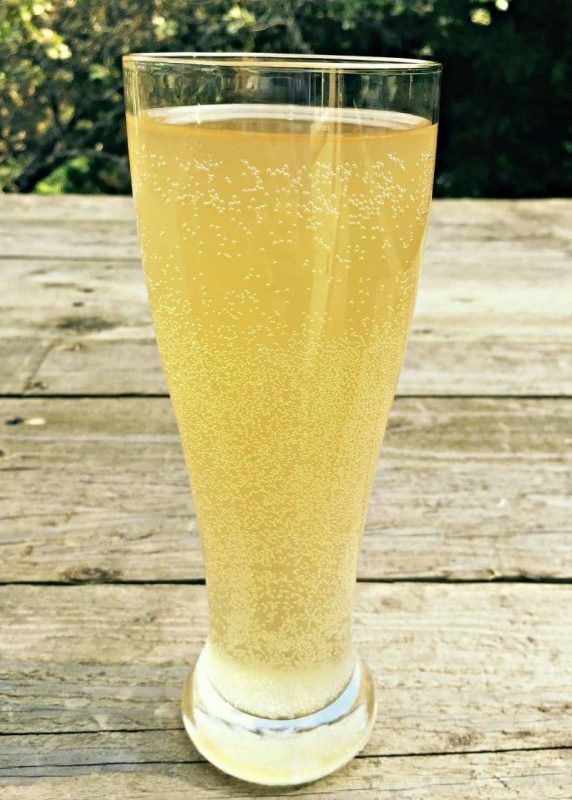 Turn water kefir, a healthy probiotic drink with gut healing properties, into an all natural herbal soda! 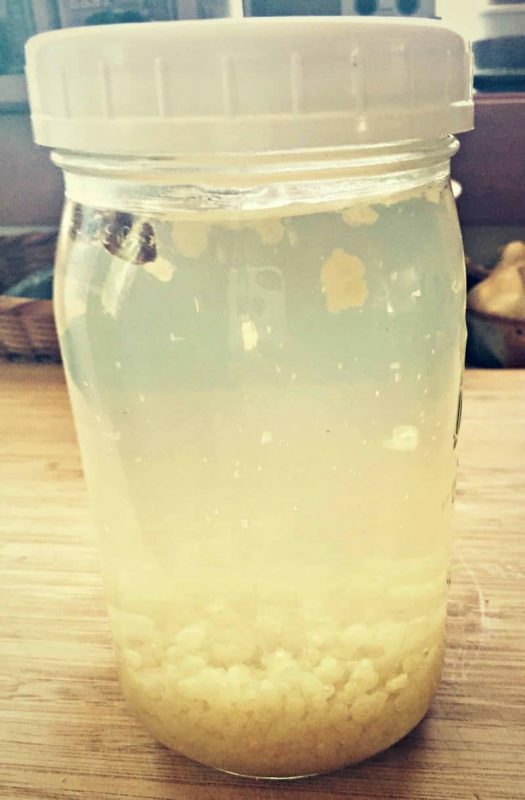 Place a few tablespoons of water kefir grains into the bottom of a quart jar. Add 1/4 cup of sugar and raisins. Fill up your jar with water, leaving about an inch of space at the top. 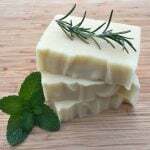 Stir gently with a long spoon to dissolve the sugar, being careful not to break up the tibicos. Once it’s at the sweetness level you desire it’s time to think about the flavoring you would like for you soda. You can use fruit juice, flavored teas, or anything you think would make a good soda! For this one I’m using lavender and elderflowers. Start by bringing a quart of water to a boil and steeping the tea. Steep for several hours to make a strong tea and cool to room temperature. 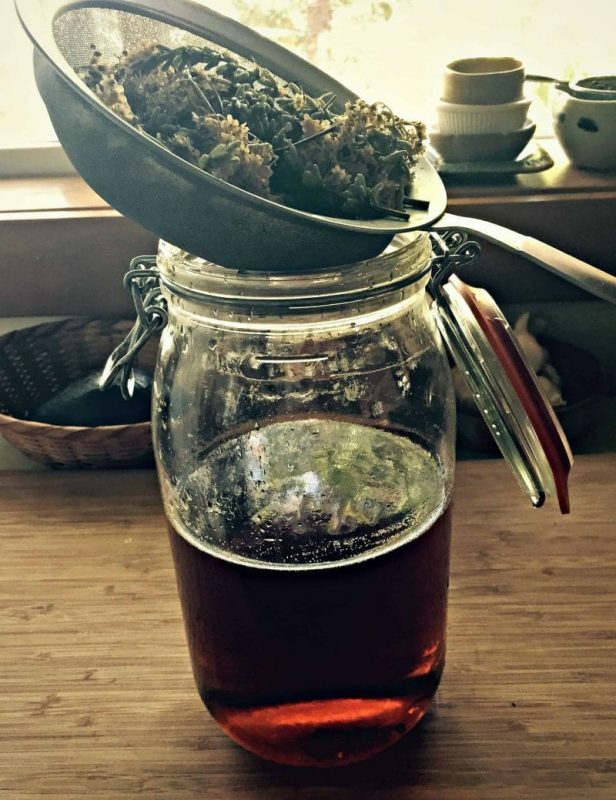 Strain out the flowers/herbs and pour the tea into a half gallon jar. Bottle the soda and leave the sealed bottles out at room temperature for a day or two, then refrigerate before opening. Careful when you open it as it will be carbonated and might be explosive! It probably won’t, especially if your flavoring isn’t sugary as that feeds the carbonation. 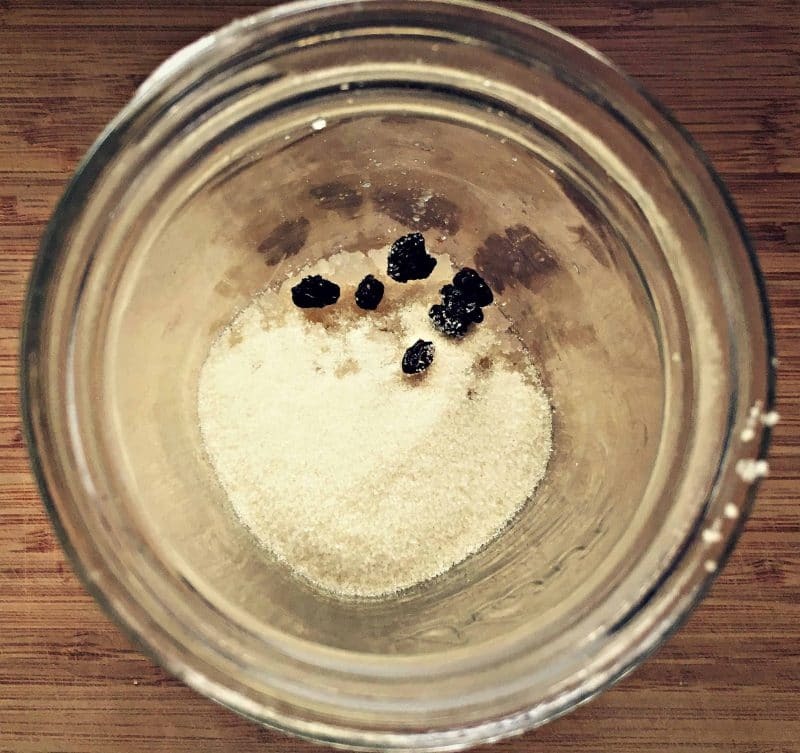 I’ve always been told to completely dissolve your sugar in the water before adding your culture to the jar since undissolved sugar grains touching your Kefir grains can harm them. And as far as i have ever read, the alcohol comes on with time. 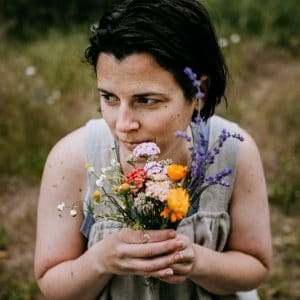 Not all fermented products have alcohol. My pickles sure dont. 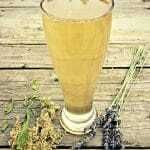 Length of time turns the probiotics further to alcohol. And Never use metal with your kefir…which could be why yours takes so long… usally 24 – 48 hrs for the first ferment. 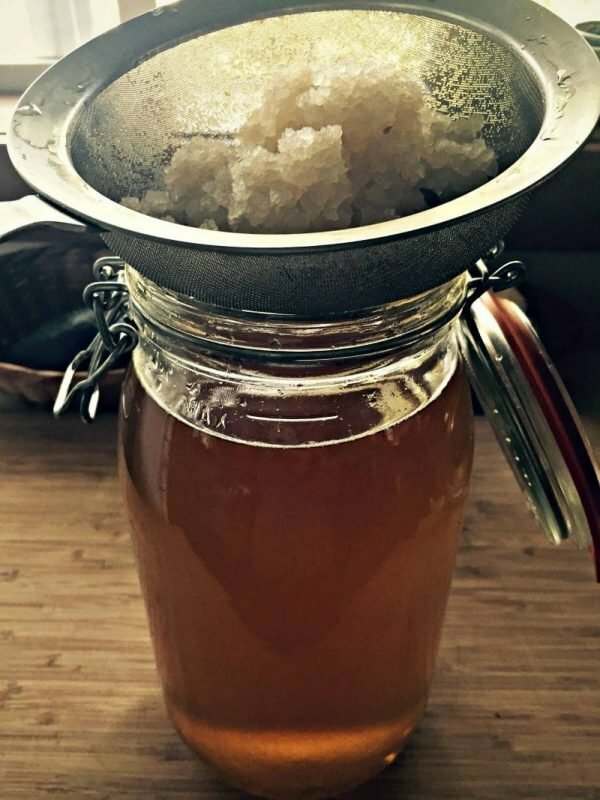 I have a coconut sugar kefir that is bubbling in 12 hrs… my cane sugar kefir likes the full day plus… and is my fave kefir for clean flavourings…. 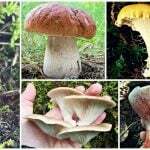 Great article, do you have a list of flavours and combos of herbs and or herb fruits yiu have tried? 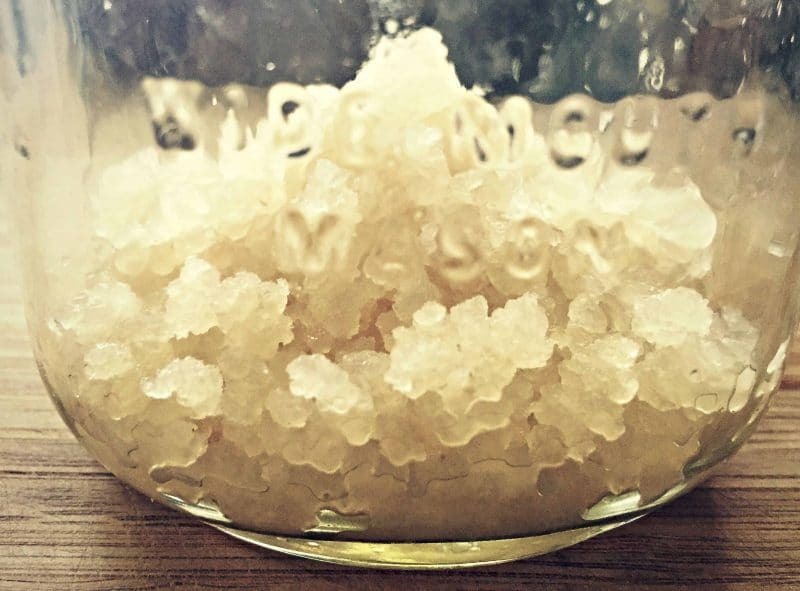 Is it safe to order kefir grains online? I worry that they could be negatively impacted during the shipping progress. 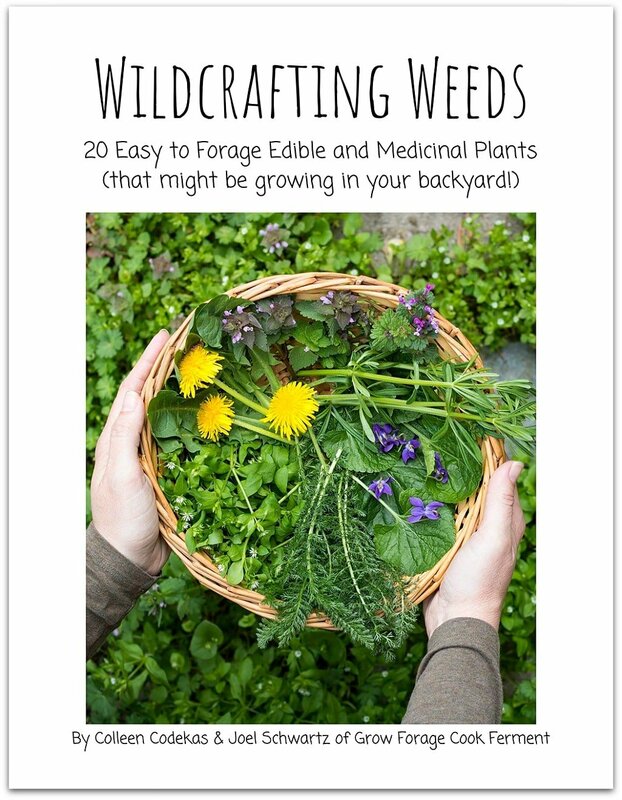 I guess I don’t know enough about them – but I might try to source them locally if I can find them. 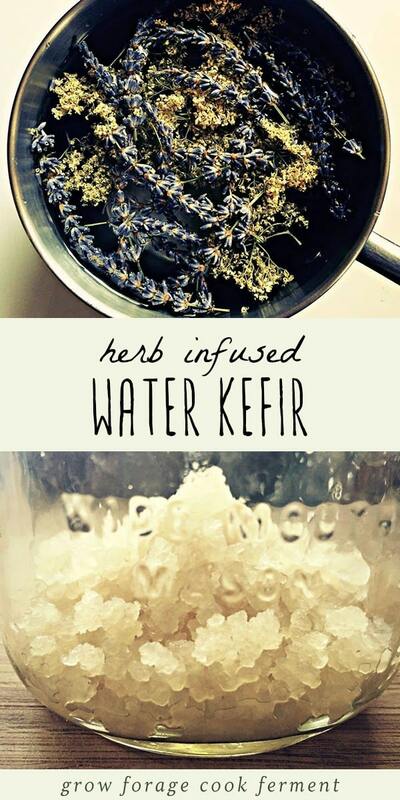 I really want to try and make water kefir soda! Thank you for sharing this recipe. 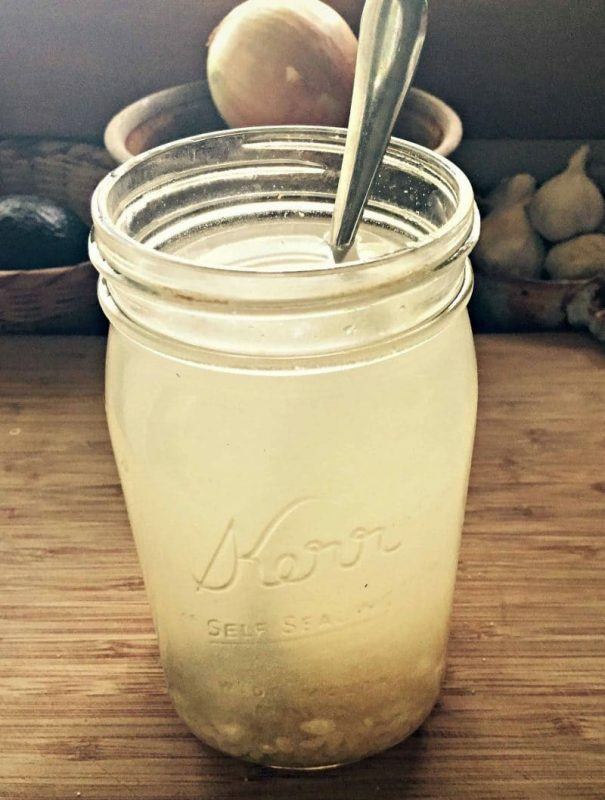 I tried making water kefir one time and it smelled and tasted alcoholic. I even gave some to my 5 year old son before I really realized. I ended up throwing the rest away since I do not consume alcohol. Did I make it wrong and ferment too long? Is there alcohol content in yours? The amount of alcohol is very minimal, but all fermented foods and drinks do contain a tiny amount. You could use less sugar and ferment for a shorter amount of time to minimize the alcohol content. When you say: “Cover the jar with a lid and set in a dark and out of the way spot for a few days.” What type of cover do you use? Is it a tight fitting cover that causes pressure to build behind it? 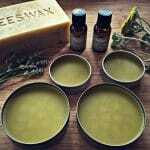 I just use a white plastic lid, the kind that you can buy for mason jars. 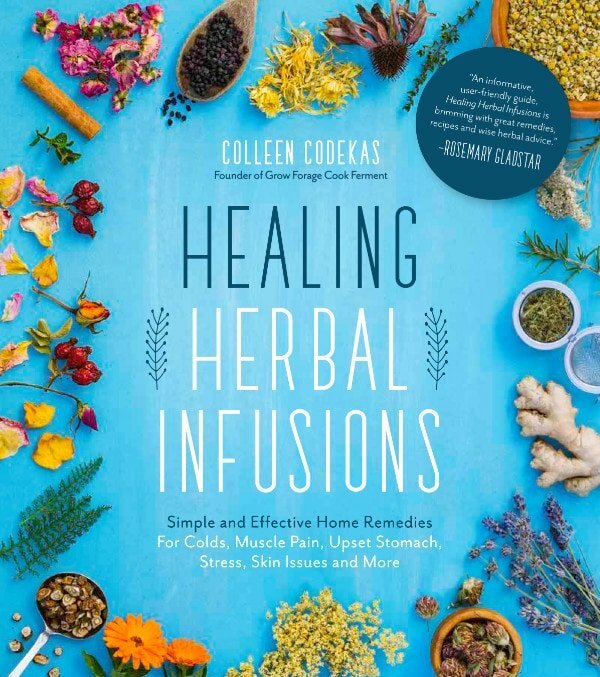 It surprised me when I first started making it that all the recipes called for covering it with a lid rather than having airflow like you would do for kombucha. I don’t screw the lid on too tight so that pressure doesn’t build… you don’t really want that to happen until you bottle it. It looks lovely, Colleen. I think my palette isn’t used to flower-y flavored beverages, but I may just have not have found the right combination last time I tried. Looks good! I love water kefir.